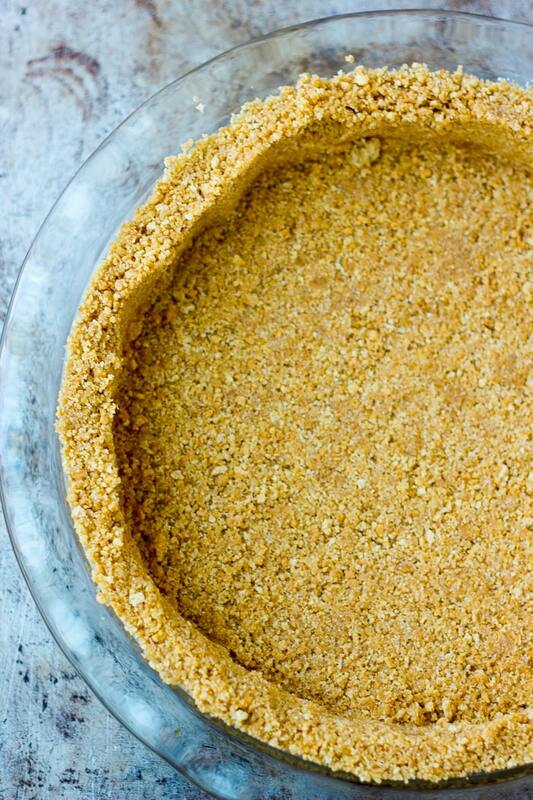 This easy graham cracker crust comes together in minutes and can be used as a crust for any cheesecake or pie filling, be it a no-bake crust or a baked crust. Use the bottom of a round glass cup or a measuring cup to help press the crust evenly into a pie plate or baking dish. Grind the cookie crumbs very fine for a more cohesive crust, or keep the crumbs more coarse for a crumbly texture. This graham cracker crust is so easy to make and can be used for any cheesecake or pie filling. This recipe can be used as an unbaked or baked crust and can be made with any flavor of graham cracker or crunchy cookie crumbs! Place the cookies into a food processor and pulse until you have cookie crumbs. Alternatively, you can place them in a ziplock bag and use a rolling pin to roll back and forth over the cookies until they are crumbs. Pour the crumbs into a medium bowl. You should have about 2 cups of crumbs. Stir in the granulated sugar and the melted butter until all of the crumbs are completely coated with butter. Firmly press the cookie crumb mixture into the bottom and up the sides of your pie plate or baking dish. The bottom of a glass or a measuring cup can be helpful to press the crumbs into an even layer. This crust can be used unbaked or baked. If you are baking the crust, bake at 375 F (190C) for 8 minutes. Allow to cool completely before filling the crust. A baked crust will have a crunchier texture and slightly more toasted flavor. If you are keeping the crust unbaked, place it in the refrigerator for about 10 minutes to firm up before filling it. ahhh I love graham cracker crusts. They MIGHT be my fave kind of pie crust!